Stripes are safe, but they’re not very interesting. And the original border showed little children at play. Now that this young man is old enough to choose his own décor, he wants something that reflected his interests – boating and the ocean. You don’t see many borders these days, but the family liked the look. 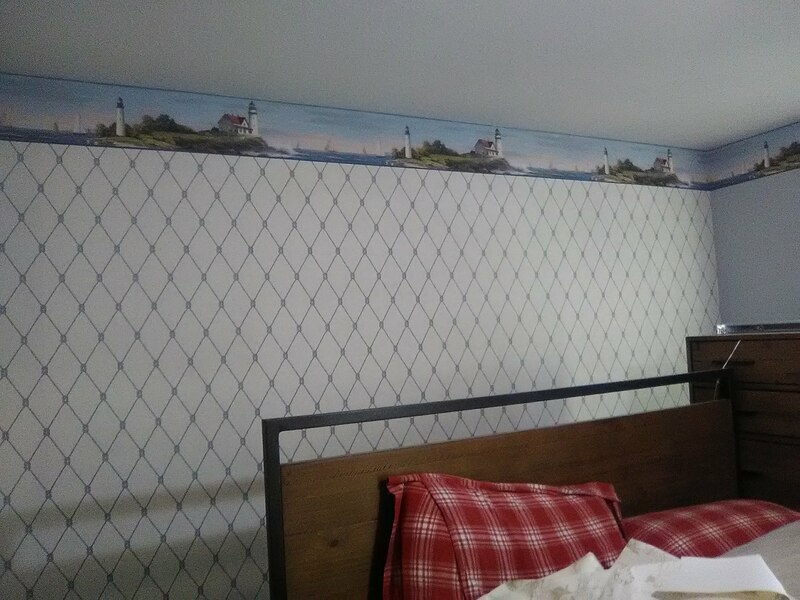 Also, because the installer who hung the original border used a rubbery paste that would not come off the wall, sealing it and hanging the new border over it is much easier than retexturing the walls. 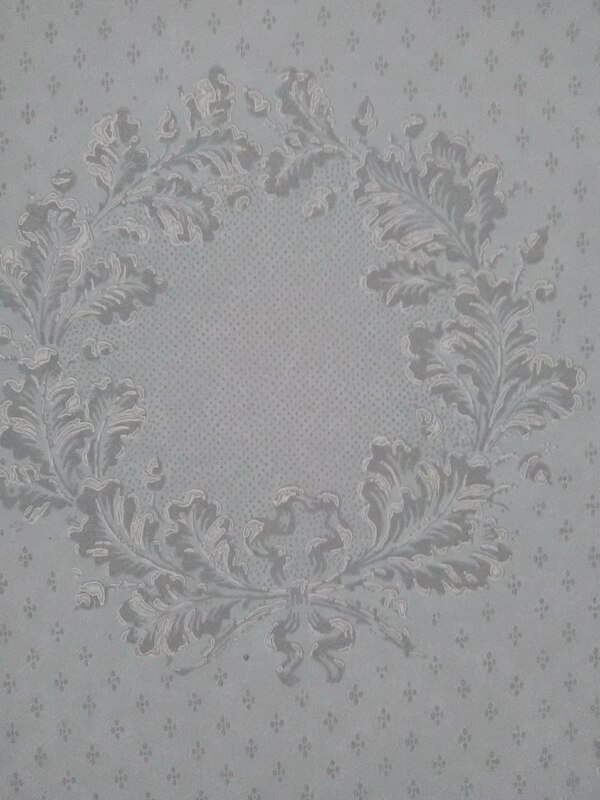 The new border is wider than the original, which works nicely to cover the old residue. 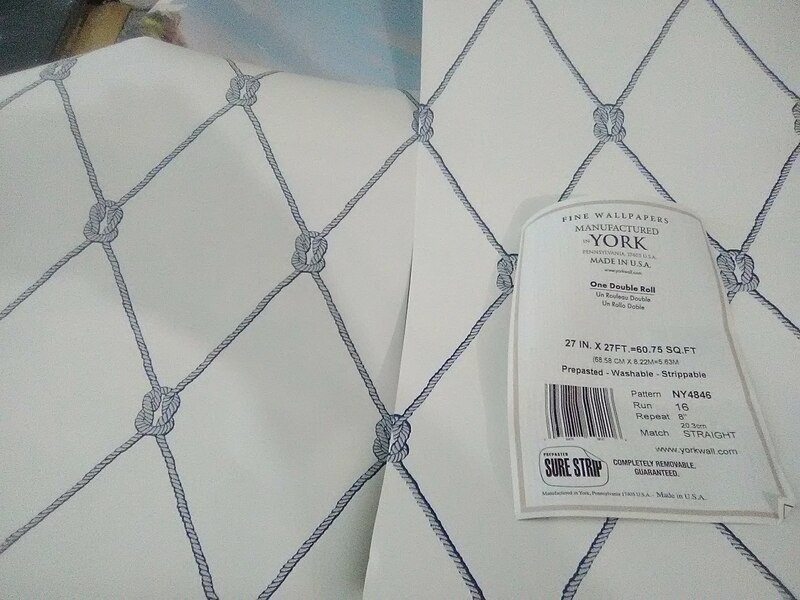 This nautical look wallpaper and border are by York, in their Sure Strip line. The job site is in Baytown, a suburb of Houston. 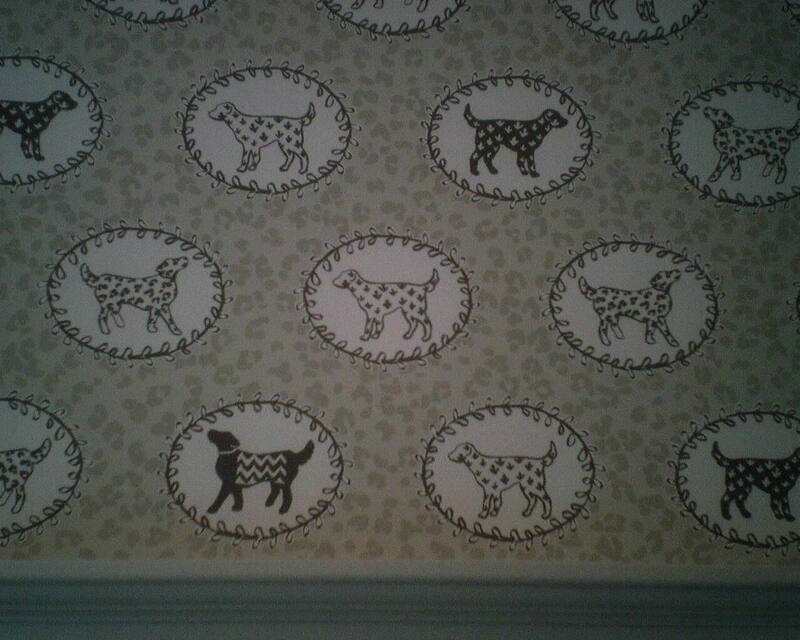 I hung this wallpaper a few months ago, and am back to do another room. 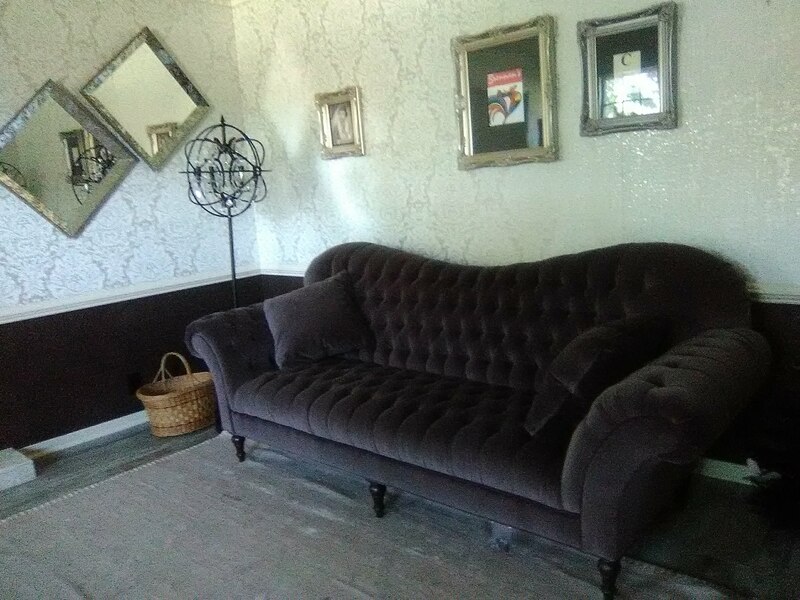 I couldn’t resist peeking in the living room to see how it looked furnished. 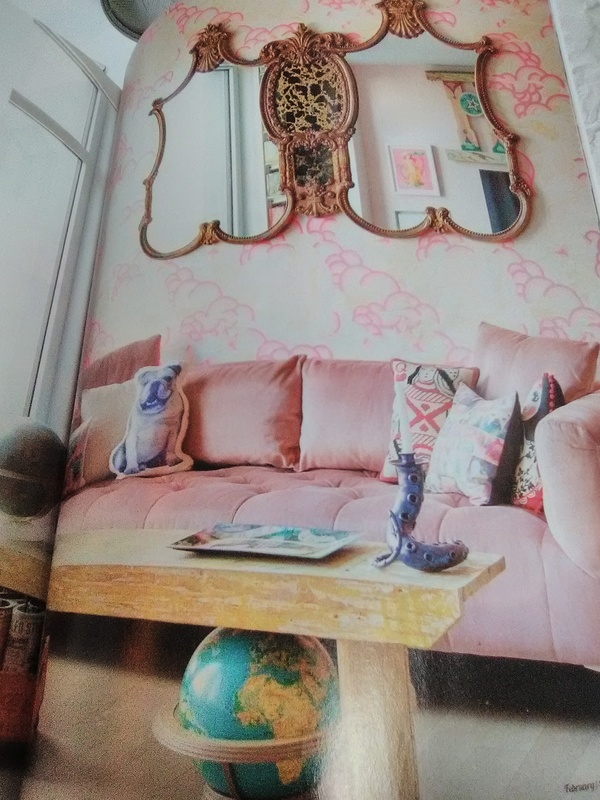 While I’d like to say that the wallpaper makes the room, really – that SOFA rocks the place! And the lamps. These homeowners have taken their time pulling their home together, and they’ve been rewarded with a unique and stunning décor. 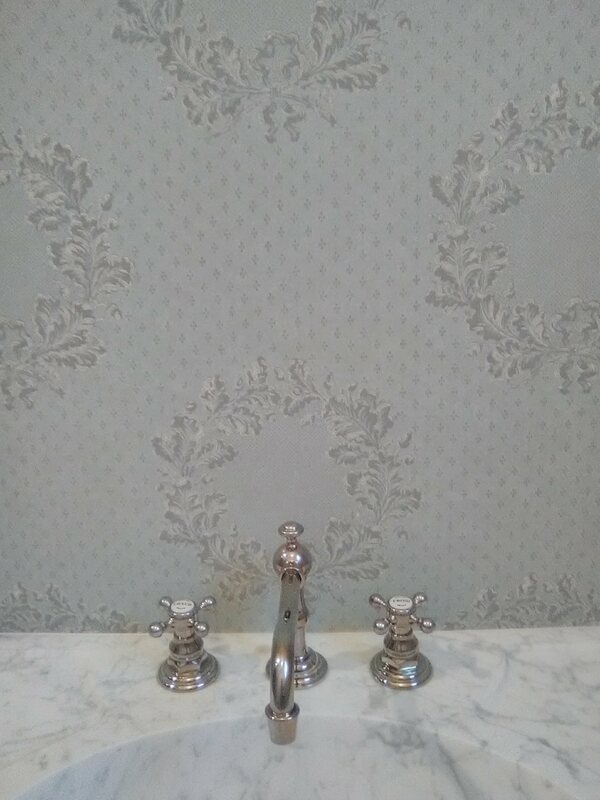 The wallpaper is by Thibaut, and is silver cork embellished with a white damask pattern. 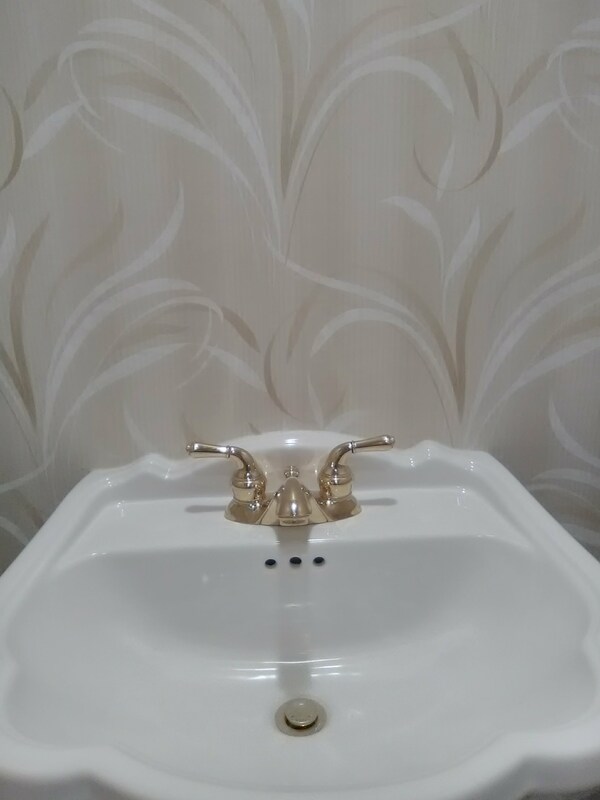 The bottom of the room is covered with dark brown cork wallpaper. 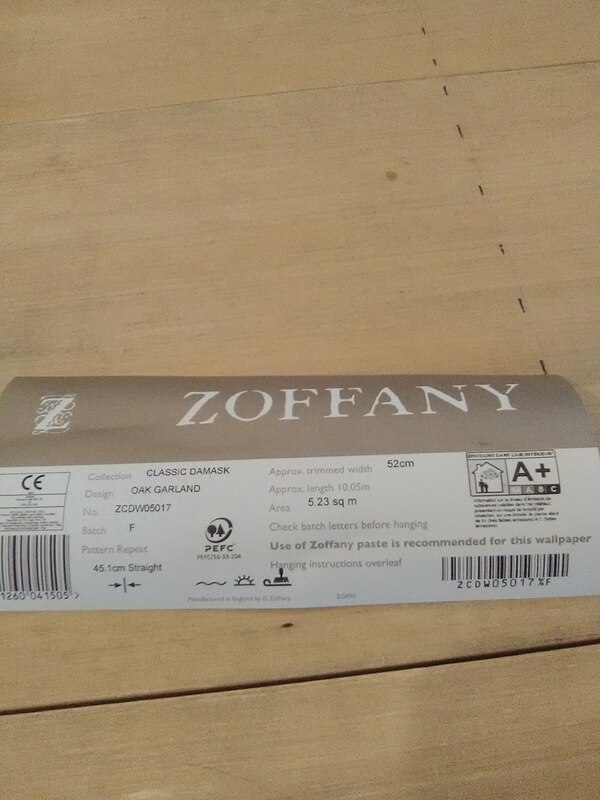 Both were sold by Dorota (see Where To Buy Wallpaper link to the right of this page). The woodwork and cabinets throughout this home in the West University (Houston) area were originally painted a smudgy, moldering, dispiriting grey-green. 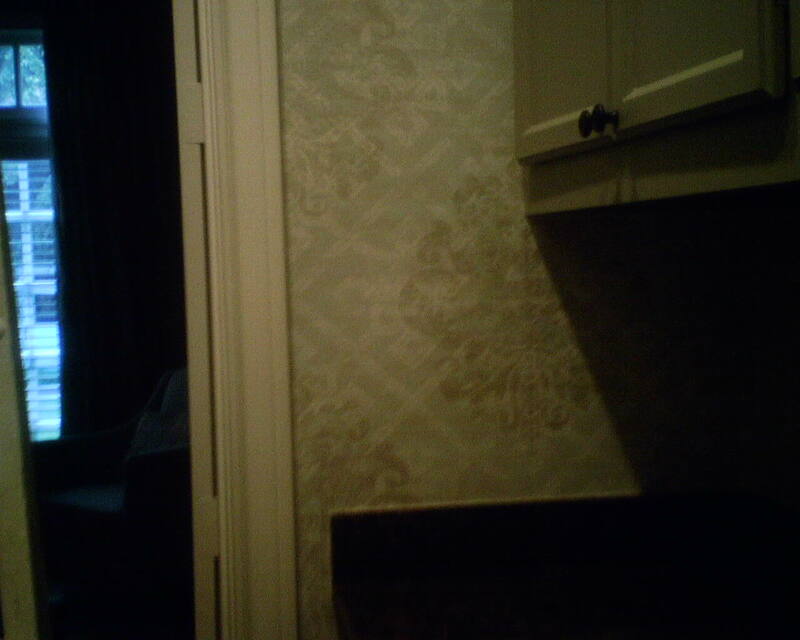 Many of the walls were a similar sad color. The new homeowners hated the gloomy green, and had all the walls and most of the woodwork lightened up. But the green wood stayed in the bar area. 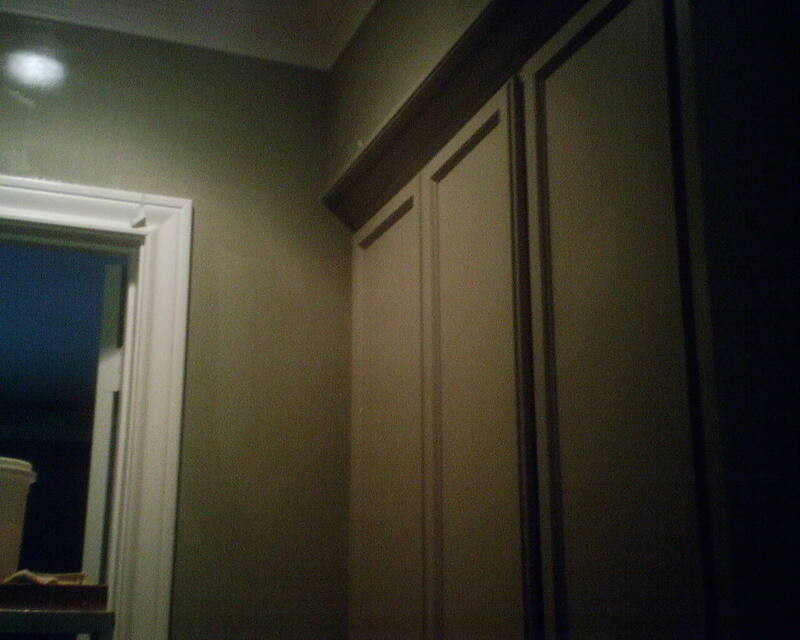 In addition, the bar was papered with a dark moldery green stripe pattern. 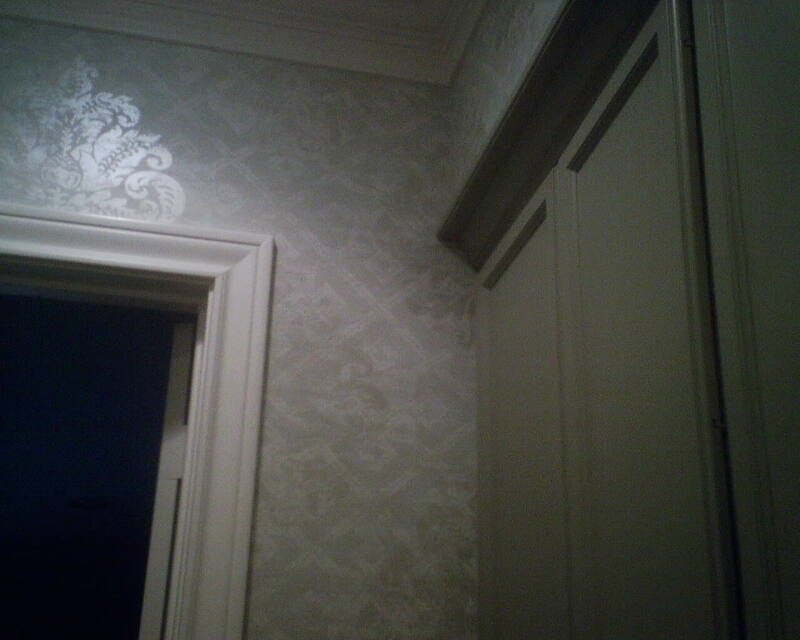 There wasn’t much differentiation between the walls and the trim, and the whole room had a feeling of malaise. 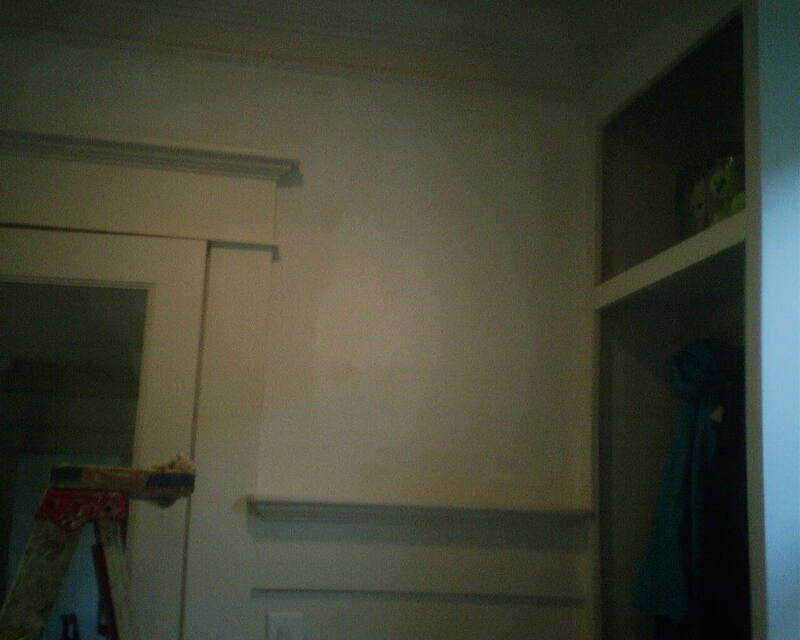 Repainting the woodwork would have been costly. 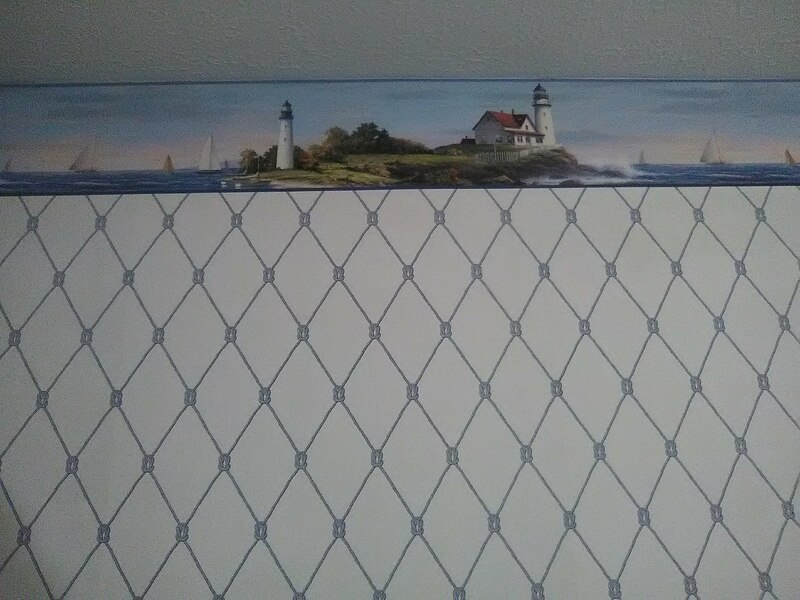 So the interior designer found this lovely pearlized wallpaper that lightens the mood in the room, and also coordinates nicely with the paint color on the trim. 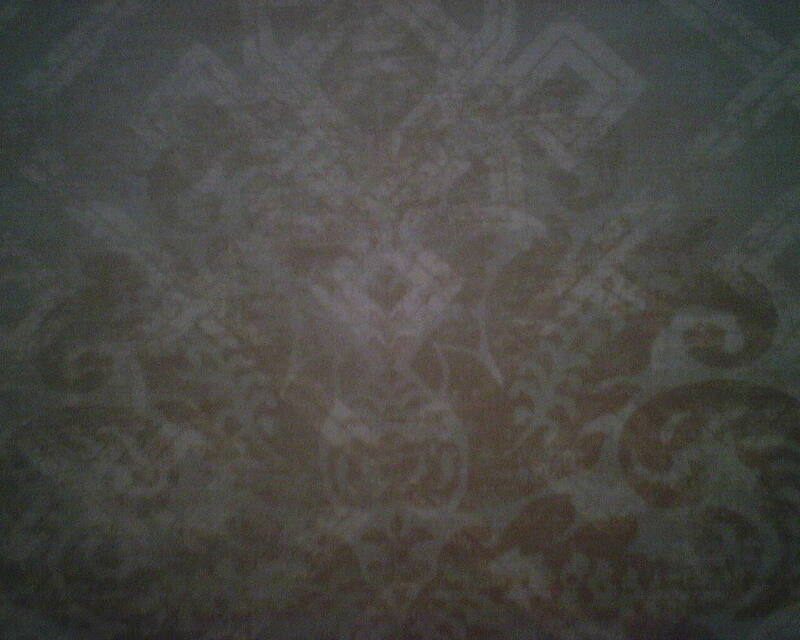 In addition, the large damask is a classy pattern that fits right in with the home’s lightly-traditional décor. 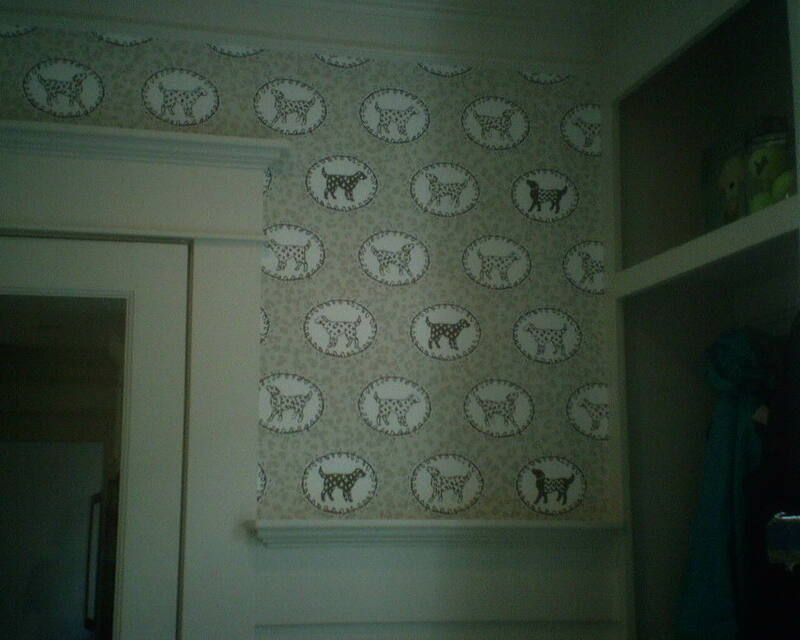 The two large dogs who live in this home in the Woodland Heights (Houston) have their own room (which is also the home’s mudroom). They may have fancy digs, but the décor was bland. See top photo. A little wallpaper changed all that. 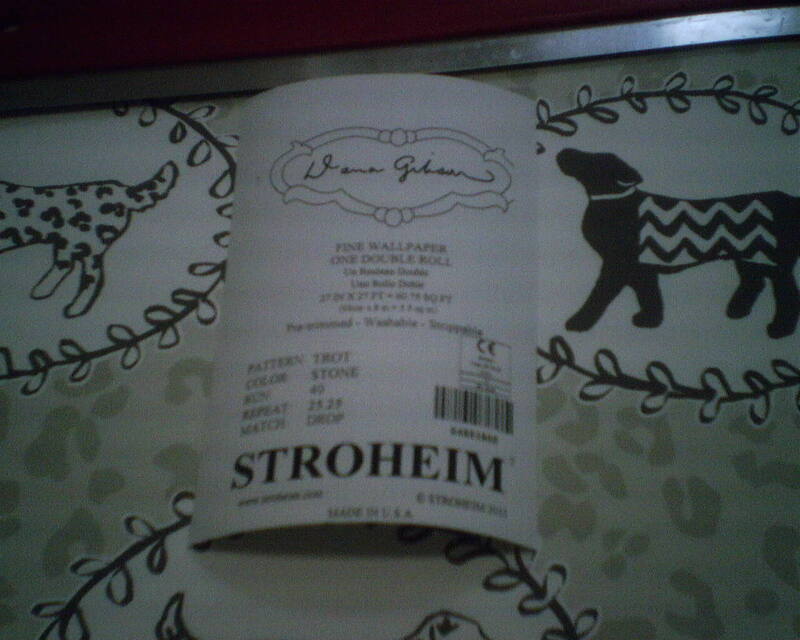 This “Trot” pattern by Stroheim is fresh and cute, but not in a cloying way – while it’s fun, it’s actually pretty sophisticated for a rear entry. 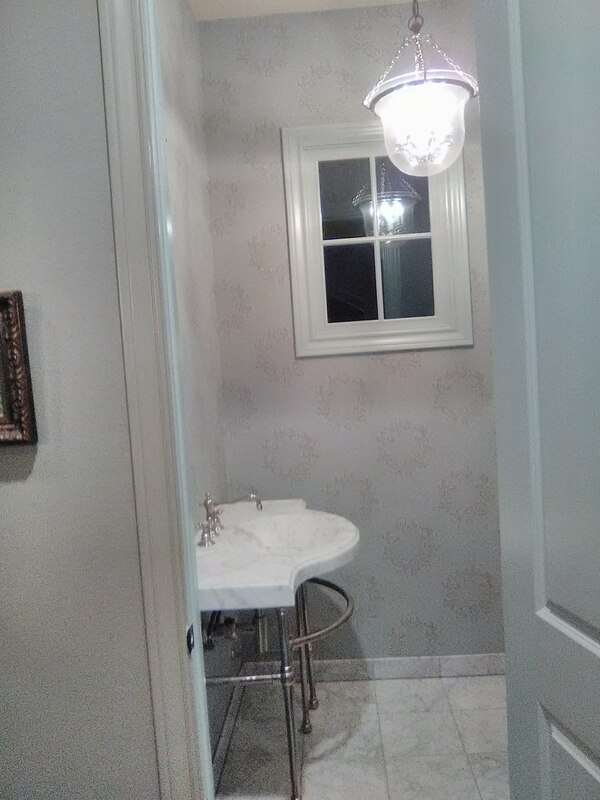 The Stone color goes amazingly well with the paint on the wainscoting and other trim in the room. The interior designer is also the homeowner – Stacie Cokinos, of Cokinos Design, here in Houston. She works a lot in the Heights neighborhoods, and works on a lot of whole-house remodels, and new builds. 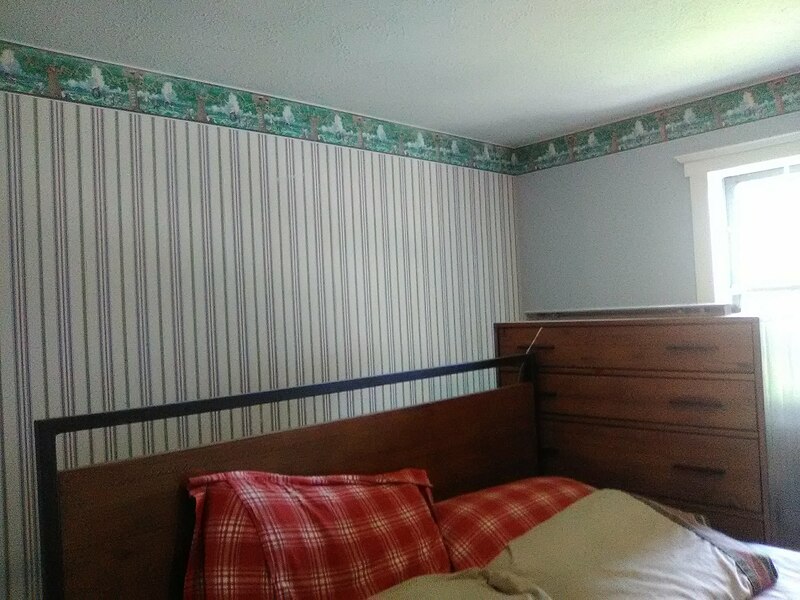 I hung wallpaper this week in a home where PhilPaint was doing painting work. http://philpaint.com/ Excellent company, by the way, with nice guys and good work. They can even do things like repair Sheetrock and install crown molding, saving the homeowner having to hire multiple companies. 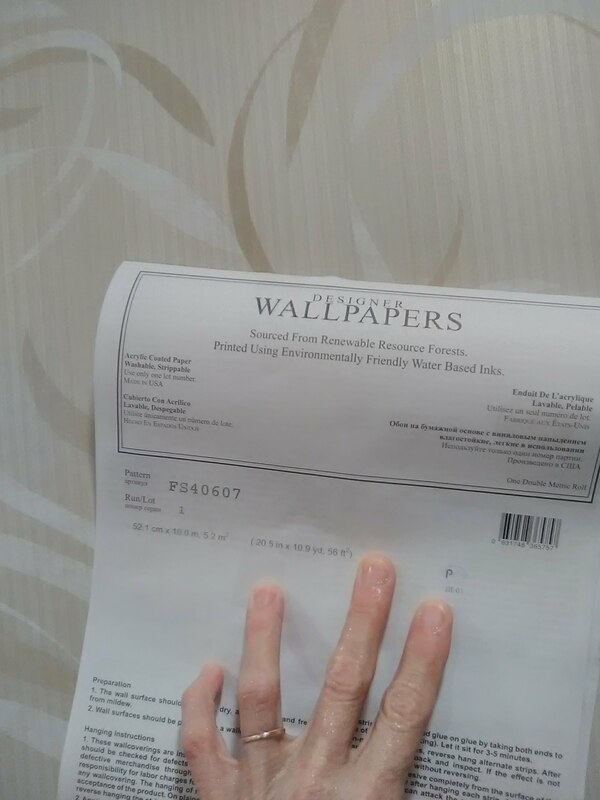 Anyway, one of the painters would come into the room where I was working, to talk about wallpaper, and other topics. We had lots to talk about. 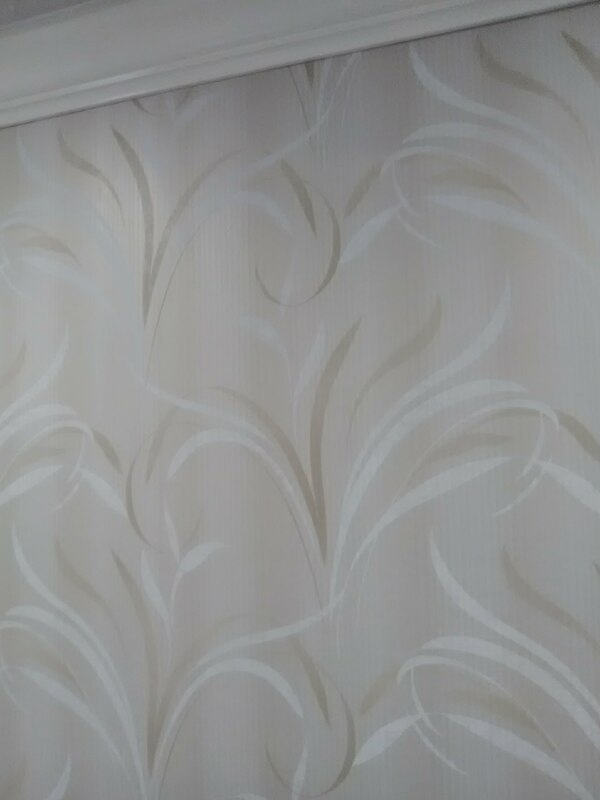 Then I mentioned how I had visited the client’s home to do the bid, and helped them look through wallpaper selection books. 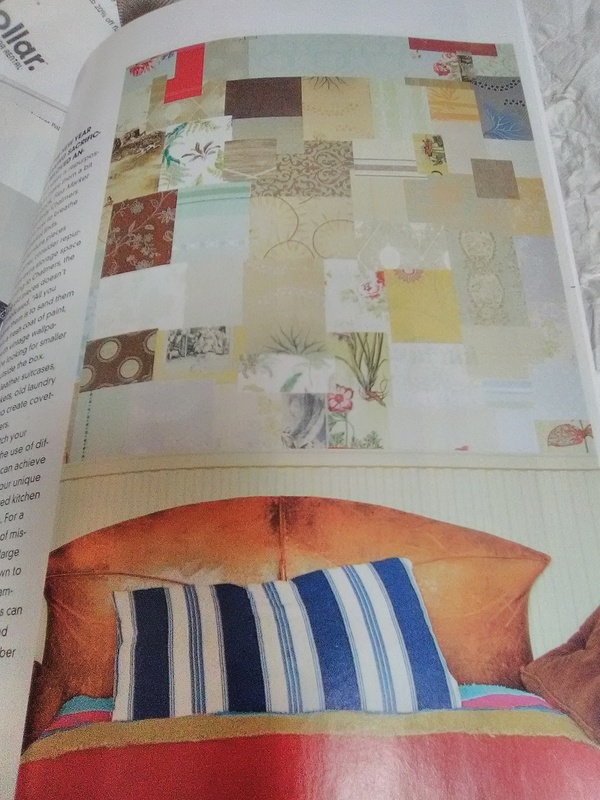 I started talking about pattern and scale and color and coordinating with furnishings, etc., and how much I enjoy helping people choose their papers. Then I noticed the guy’s eyes starting to glaze over. He didn’t have a clue what I was talking about. “Don’t your painting clients ask you about color selections, or decorating ideas?” I asked. “No,” he said. “They don’t ask, and I’m glad, because I would not know what to say about decorating. 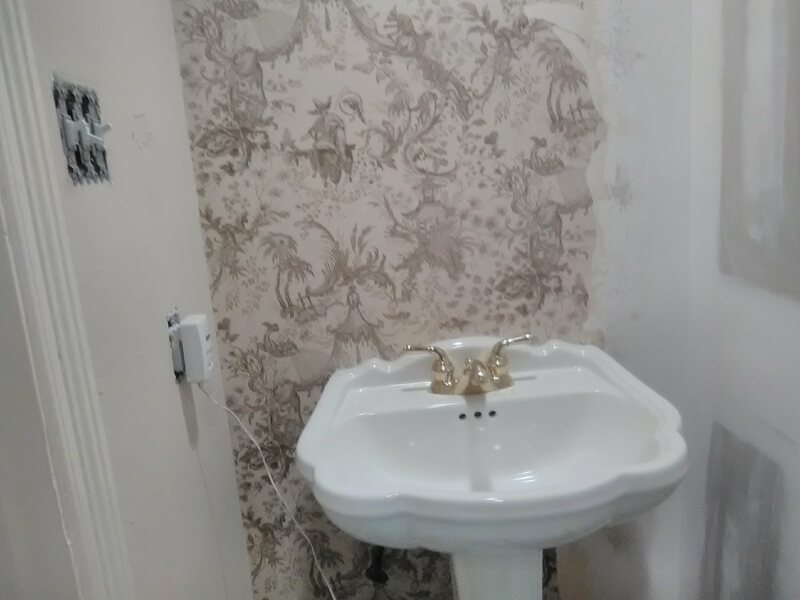 Well, I guess that, from the customer’s point of view, paint and wallpaper are two different things. 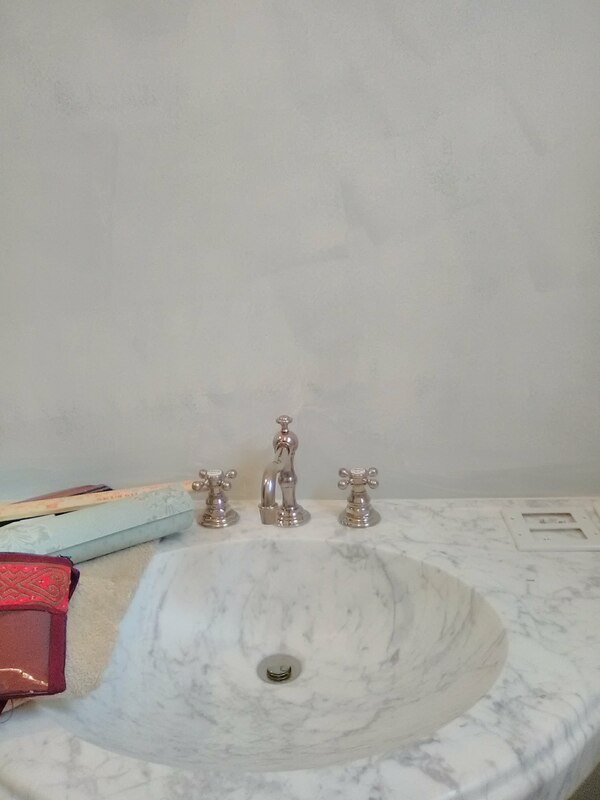 Paint mostly freshens a room, while maybe adding some personality if it’s a specific color. 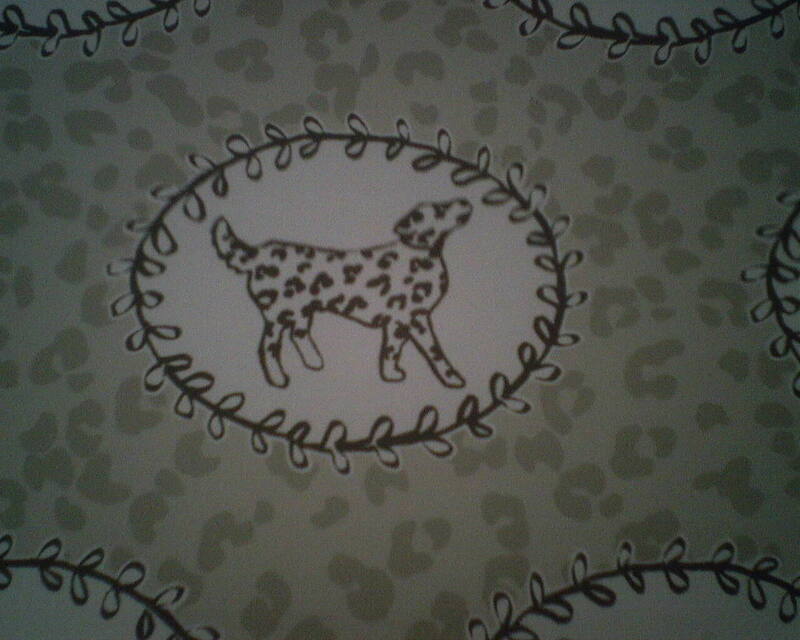 But wallpaper really makes a statement, and influences the whole feel and decor of the room. 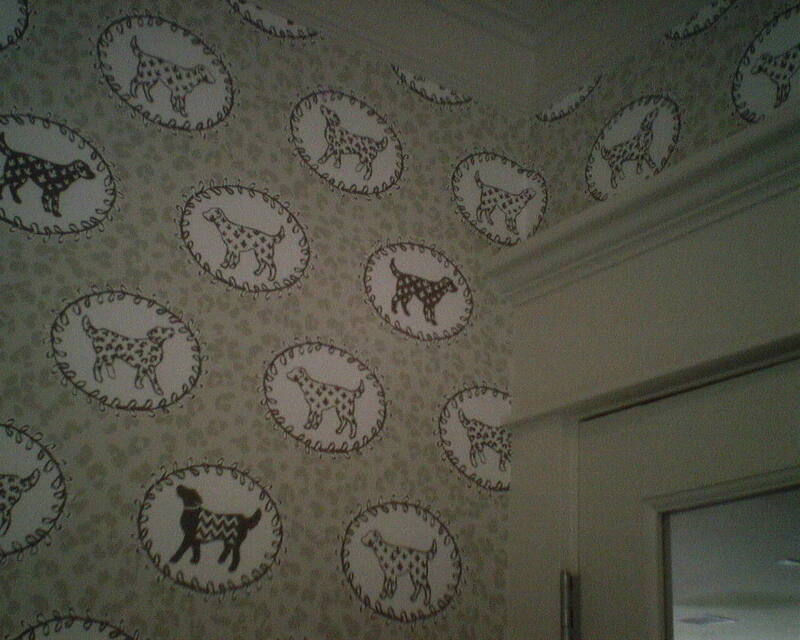 So the wallpaper choice really has a whole lot more to do with the final look of the room. And homeowners like to ask me my ideas about that. 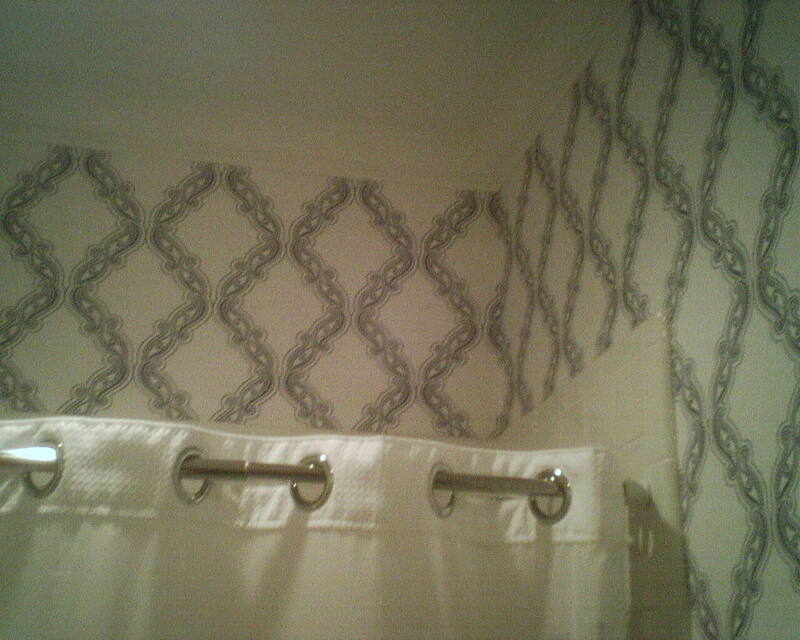 Another thing is, I guess because I’m a gal, homeowners feel I’m more decorating-oriented, compared to the average painter guy, who would rather stick to his brushes and rollers than talk interior design.